The Works of Mr. Edmund Spenser in Six Volumes with a Glossary Explaining the Old and Obscure Words. London: Jacob Tonson, 1715. 6 Volumes. This set includes the first annotated edition of The Faerie Queene. The editor, John Hughes, worked mostly as a translator but is most widely known for his role as a Spenserian editor. This edition is a collation of the first three editions (1590, 1596, 1609) and includes several essays by the editor on the life of Spenser, allegorical poetry, and specifically The Faerie Queene. For the first time, Hughes included two separate endings to the third book. The first appeared in the 1590 edition and the second in the 1596 edition. It is unknown why Spenser changed the ending in the second edition. 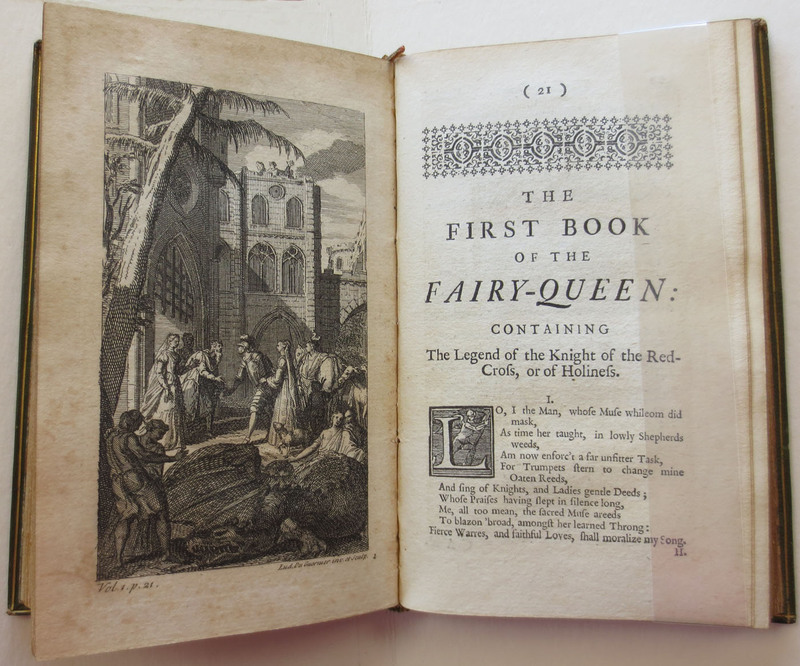 This edition is an early illustrated edition of The Faerie Queene. Illustrations are by Louis du Guernier (1687-1716?) who was 'lamented as the foremost of engravers' at the time of his death in 1716 of the smallpox. He worked extensively with the Tonsons producing many illustrations which appeared in their editions from 1714 to 1735.